Since 2011, All American Martial Arts has provided its members with a road map to success based on self-defense, confidence and goal-setting skills. Our Mission is to help you raise a confident, respectful and focused leader through the life-transforming experience of martial arts, while we adults train to get in the best shape of our lives. At All American Martial Arts "We Build Champions in Life". All American Martial Arts is one of the nation’s top-rated and premier martial arts schools. We are dedicated to providing the best possible martial art lessons at an affordable price. We specialize in martial arts training and self-defense classes for both children and adults. Our children's martial arts program creates leaders. We do this by teaching the same values you teach at home. Our adult program is second to none. From traditional martial arts to more modern self-defense styles, there is something for everyone at All American Martial Arts. If you are looking to burn major calories, learn self-defense moves and get in the best shape of your life, you must come and check out our program. Our dedicated black belt instructors help each student reach their fullest potential. We maintain a strict discipline of courtesy, respect, self-control, and integrity. We prepare each student to move forward in life with the utmost confidence. We help shape our student's minds and bodies into seeing and believing they can succeed at anything. Hard work and perseverance are the keys to success. At All American Martial Arts there is no sitting on the bench and No Excuses. Each student participates in the entire class every time. Imagine yourself or your child as a stronger, more confident individual in your best physical and mental shape. I want to personally invite you to take advantage of our introductory trial offer and turn that vision into a reality. The Journey Begins With You! Our programs have a strong focus on personal development. The foundations of our morals, values and core character traits are formed in our early years. For this reason, the programs at All American Martial Arts are an essential way to enhance the growth and personal development of young students of all ages. We teach all of our members to focus on and be present in the moment. • Our members are from all walks of life - we have students, attorneys, doctors, engineers, military and law enforcement all training in a fun, team-oriented family environment. • We have kids that have been training for years that leave to top colleges and universities in the country, thanks in part to the discipline and focus on hard work they learned through martial arts. This is something we take a great amount of pride in. • There are always new generations of individuals and families coming in to pursue the ongoing legacy. 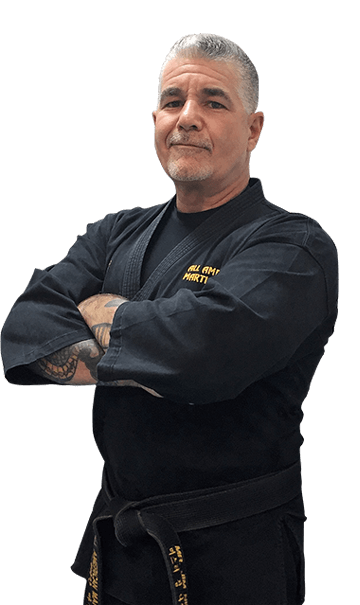 It is a tradition in martial arts to pass down the knowledge one receives in their training and many students become instructors, often ending up owning their own schools. And while the kids have their fun, our adult program is second to none. From traditional martial arts to more modern self-defense styles, there is something for everyone at All American Martial Arts. If you are looking to burn major calories, learn self-defense moves and get in the best shape of your life, you must come and check out our adult program. We offer a 10% off all - active military, police officers and fire fighters. When a family has two family members enrolled in one of our many Martial Arts programs the rest of the family trains for 1/2 Price in our basic program (must be an actual family member, higher program price prevails).